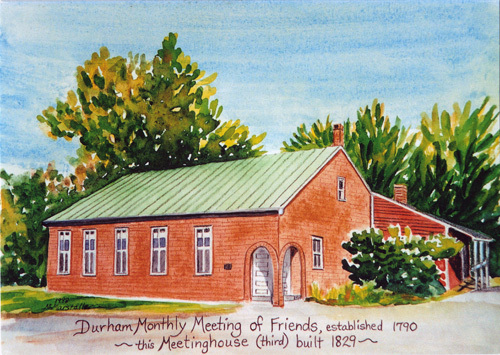 Durham Friends Woman’s Society met at the home of Dorothy Hinshaw on June 20, 2016, with ten women in attendance for the meeting and the high tea which preceded the meeting. Angie Reed was not at the meeting so Katherine Langelier took minutes. Martha Sheldon presented the program from Blueprints which was written by Durham’s own Leslie Manning. In the business meeting, President Dorothy Curtis opened the meeting with Kitchen Table Wisdom, by Rachel Naomi Remen. The card ministry was discussed and carried out. Nancy gave the Treasurer’s report during which a collection was taken. The Children’s Day offering was $367.25 and we added to that from our treasury to make the donation $400, which goes to the USFWI Children and Youth Projects. The meeting discussed the previously approved donation toward expenses of our member attending the United Society of Friends Women International Triennial, which will be held in Cedar Rapids, Iowa, July 7 – 10. Prayers were requested for our member attending the Triennial, for all the people attending the Triennial and attempting to attend. Prayers were also requested for a member with difficult issues. The women on the Tedford meal team for May gave a report. It sounded delicious and the story of getting it there provided quite a funny tale. The Nominating Committee gave a report: Nancy Marstaller will be our new Treasurer. After thanking Dorothy Hinshaw and Martha Hinshaw Sheldon for their hospitality and program we all headed back home. The next meeting will be held on July 18 at the home of Helen Clarkson.